The Housing Industry Association predicts a gradual broad based recovery in residetnial constrauctions over the next few years in its recently released National Outlook. 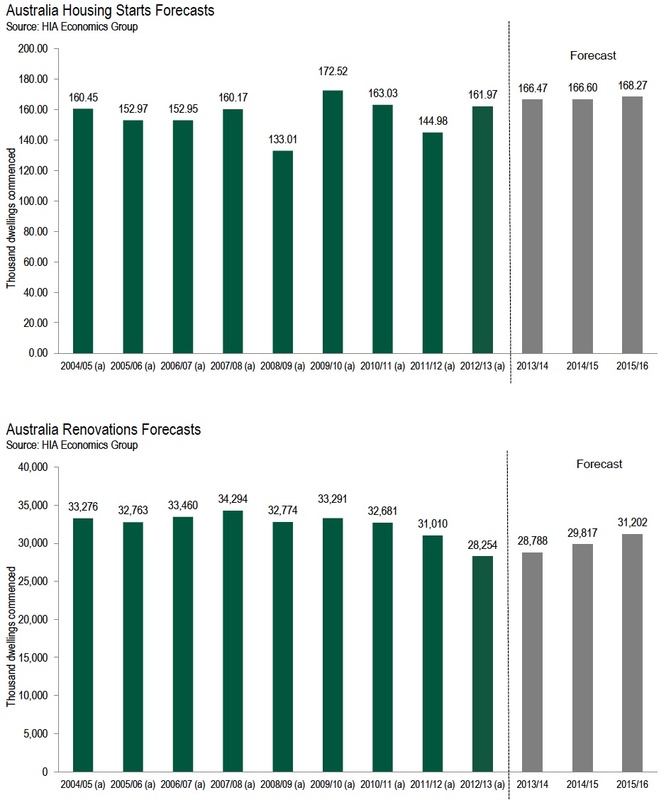 Our latest set of forecasts suggests that the housing industry will be one of Australia’s good news stories over the next twelve months. This will be driven by much stronger activity in markets like NSW, Queensland and Western Australia. However, challenges will remain in other states, more notably Victoria and Tasmania. We believe the RBA will leave its interest rate unchanged for the remainder of this year at least. This will underpin strengthening activity in housing, and arrest the deterioration in housing undersupply experienced over the past decade. Renovations activity has struggled over the past five years, but we see light at the end of the tunnel here also. Stronger prices will speed the accumulation of home equity, facilitating more home renovation loans. Housing starts increased by 11.7 per cent to 161,970 during 2012/13, following two consecutive years of decline. Activity is forecast to rise again in 2013/14 by 2.8 per cent, going on to reach over 170,000 by 2016/17. On the renovations side of the market, the volume of activity fell by 8.9 per cent in 2012/13 to $28.3 billion.